Sibton Orphans' Home was established in 1866 'to provide maintenance and education for orphan girls and boys of a superior class from all parts of England.' The Home was founded by Miss Margaret Green of Sibton Abbey, after a family of her acquaintance, with nine children, were left fatherless and motherless. After her attempts to get the children accepted at existing orphan institutions were only partially successful, and several seemed likely to end up in the care of the workhouse. Anxious to prevent this, Miss Green, with the assistance of her sister, decided to set up a small establishment of her own. She took a small cottage for the purpose and set about raising funds. Children began to be admitted in March, 1868. Applicants for admission to the Home were required to provide certificates of the marriage and death of both parents, and birth and baptism of child, and a medical certificate of general health and freedom from infection, scrofulous disorder, or fits. In the case of unbaptised children, a statement to that effect was accepted. An admission fee of £10 was payable. Admission was confined to cases of real necessity, with the child being utterly destitute and a complete orphan, or virtually so. Fatherless children could be received as paid or partially paid cases if there was room, but preference was always be given to complete orphans. Girls were received between the ages of 4 and 10, boys between 4 and 8. In extreme cases, and at higher entrance fee, children of other ages could be admitted. Recommendations on behalf of applicants were required from the clergyman of their home parish and one householder. The Home aimed to provide inmates with a good education, equipping them to work as teachers or in business, and leaving the Home when fit for a situation. As well as donations, the Home generated a small income through an annual sale of goods it held at Yoxford or Saxmundham. By 1877, however, the Home had accumulated significant debts and an appeal was made for more funds, which resulted in some criticism of Miss Green's ability to run the Home. By 1880, the children had been moved to temporary premises at 5 Aquarium Terrace, Wellesley Road, Great Yarmouth. The following year, a house was rented on Great Street (now High Street), Yoxford, where most of the children then returned, with a few remaining with their matron at Great Yarmouth. Later in the 1980s, the Home also appears to have made use of a property at 23 Trafalgar Terrace, Trafalgar Road, Great Yarmouth. Miss Green died suddenly in July 1888. In 1890, the Home's location was listed as being at Bromley House, 63 Apsley Road, Great Yarmouth, with 24 inmates accommodated. However, the establishment appears to have ceased operation at around this time. 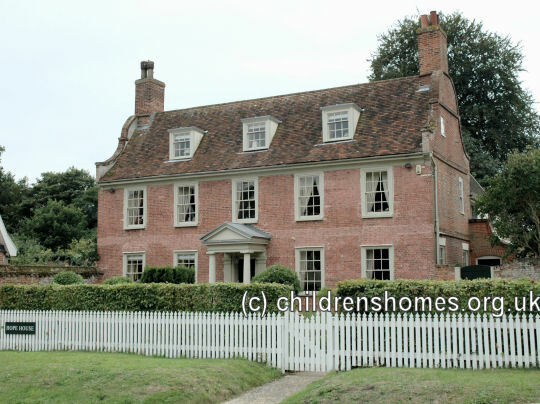 Coincidentally, the Home's Yoxford premises, which adopted the name Hope House, were later used by the Blything Poor Law Union to house workhouse children.